We often think that choosing a business name and branding are going to be the hardest decisions we are going to have to make in our businesses. But as business owners, we know that’s just the tip of the iceberg. Tough decisions will follow you through your business journey with none more prevalent than deciding on your website function. Making the decision on which website platform to use is one that many business owners struggle with. There are so many options available, all with varying features, that it makes it almost impossible for any new business owner to decipher. So, when everyone has their own opinion, how do you know which website platform is the right one for you? We are going to break down 6 popular platforms for you today. We are taking a totally unbiased, straight to the facts approach so you can relate each one to your needs. In no particular order, let’s get into it. Used by over 20% of the world’s online websites, WordPress is by far the most popular platform on the market. It’s a blog based platform, however the addition of plugins and themes have enabled it to become virtually anything you need. WordPress is very versatile and turning it into an eCommerce store is also fairly easy to do with a plugin such as WooCommerce. The reason WordPress is so popular is because of its high opinions when it comes to SEO performance and ability to multi-function. Developed as a blogging platform, WordPress has a good SEO structure and additional SEO plugins will also help you in that area. 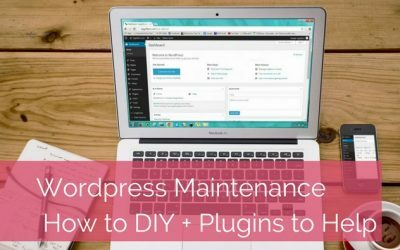 Due to the infinite number of themes, plugins and functions, WordPress does have a little bit more of a learning curve than the other DIY platforms. But once you have spent a little bit of time in there, you will find that it isn’t as scary as you may have thought. The complexity can come depending on the theme you choose for your site. Some require more skill than others, but most new designs try to make them as user friendly as possible, reducing the need to know any lines of code. WordPress does require a little more design flare than the other platforms but you have a lot more themes to choose from. Upwards of 10,000! So choosing a theme can get a little daunting. But with that many options, you are bound to find what you are looking for. Most of the new or more popular themes come with page builders so the drag and drop options are there. In some cases it is handy to know a little bit of basic code, but in a simple drag and drop theme it is not necessary. The other beauty of WordPress is there is never a shortage of people who can help you. So if you want to use WordPress but it just isn’t your thing, then you will find a multitude of people to help. The popularity of WordPress has also meant there are a lot of tutorials and how-to-guides on the internet to help you in your DIY. WordPress is also know as a free platform, however only the WordPress install itself is free. If you need your site to have some character and design, you will most likely need to purchase a premade theme which range anywhere from $15 – $90USD. This is a once off price however as you will own a single lifetime license to that theme. You will also need external hosting (service providers like Siteground or Crazy Domains) and a domain name to host your site and any specialist plugins may also be at a cost. In saying that though,there are a lot of free theme templates and plugins available so it is possible to set your site up for the cost of basic hosting and domain. 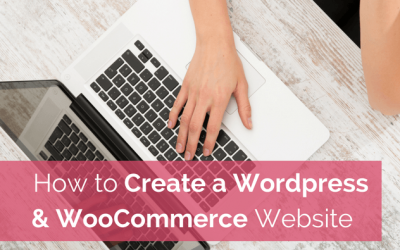 WordPress becomes an eCommerce platform easily with the integration of Woocommerce. In a few clicks you can have your site transformed into an eCommerce portal and ready to accept payments through Paypal or bank transfer. Credit card payments can also be integrated with third party apps like eWay or Stripe. AfterPay is also a plugin that is available for WordPress at a cost. All payment gateways will have ongoing transaction fees that need to be factored into any eCommerce platform. Note: There are two elements to WordPress. There is WordPress.org and WordPress.com. The two often get people confused, but they are quite different in features. 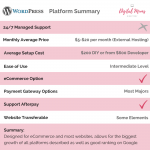 WordPress.org is a self hosted / self managed version of the platform and the version we have referenced in this comparison. WordPress.com is a managed platform generally used by personal bloggers as the basic structure is free for users. 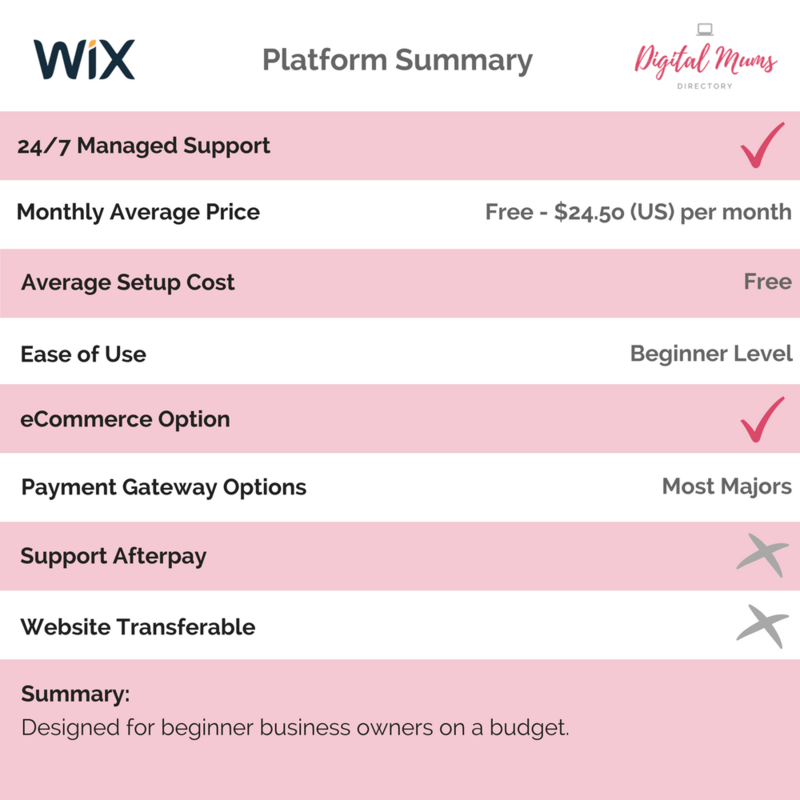 Like Wix, they host your website and have monthly plans to add more functions to your site. There are limitations in the .com version however and you may find the lack of features and functions an issue should you wish to grow your business from a basic blog site. You have probably heard of Wix in your travels. They advertise on many mainstream TV channels and were even a sponsor at the most recent NFL Superbowl! Wix has made its name being an easy start up platform to get your website off the ground quickly and easily. No coding required, Wix takes you through how to build a website on their platform using a simple drag and drop editor. Never fear if design is your downfall, Wix has premade templates for most business niches so you are bound to find something that will suit. All you need to do is edit the template with your personal branding and content and away you go. The other appealing factor with Wix is you don’t need to have your own domain name or hosting to get started. So if this side of the business is causing you sleepless nights, you don’t need to worry if you are looking at Wix as your website solution. Don’t stress if you have your own domain name, you do have the option to use this with the Wix hosting. Wix is also very cost effective and you can set your site up for free! Of course there are pro upgrades that will give you extra features. One of the most noteworthy is your own domain name and the removal of Wix advertising on your site. The upgrade packages vary in price per month and take into consideration your budget. If you are happy to forego some features and addons, then you can build a website for free as they advertise. Now, Wix doesn’t have a great name in the website developer world because of the simplicity of the system. It is often criticised for its poor SEO (Search Engine Optimisation) but there are cases for and against on this one. Being a hosted CRM platform, it doesn’t come with a lot of customisations or options. Added features like Afterpay, which is becoming increasingly popular, aren’t catered for in a Wix website. You could find that your business growth becomes halted over time with the lack of growth options. 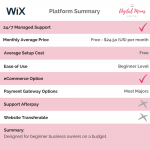 If you can overlook this, then Wix is a good start up option that will get you up and running. NOTE: A worthy point to note, being a hosted CRM platform, your website and content is locked into the Wix portal. Meaning, should you wish to change platforms in the future, you will need to start your website build from scratch as data import and export is not available. Shopify is becoming a very popular eCommerce option for small businesses. It is a little bit like WordPress and Wix merged with their own tweaks thrown in. 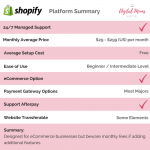 Like Wix, Shopify is a hosted platform meaning they host your site on their servers. Like WordPress though, you use your own domain that you purchase through a domain reseller (like Crazy Domains or Go Daddy) and point it your store. You pay a monthly fee for the hosting and website portal and also have access to 24/7 support. This can be a huge draw card for a new online business owner learning the ropes. 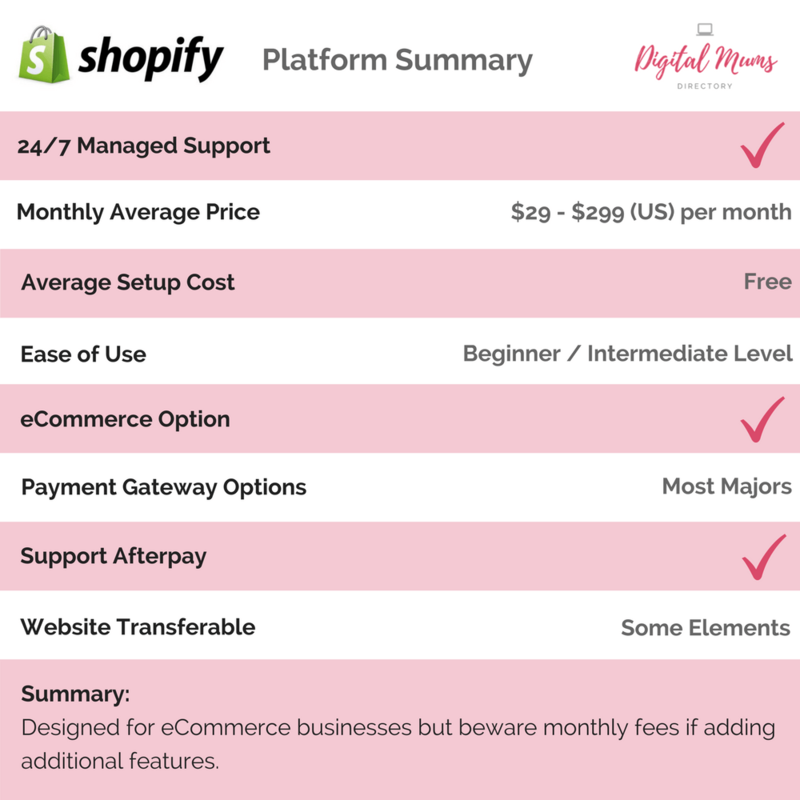 Shopify prices are more expensive than Wix starting from $29 per month and there are added costs as you go through including transaction fees and additional apps. But this will all depend on your business requirements. Like WordPress, you select a theme for your store and activate it on your shopify site. Themes on Shopify are professionally developed and are generally of a high quality. You can opt to use a free theme or pay for a pro theme or have one professionally designed. You have the ability to be able to stick to your selected theme style and simply add in your own content, images and payment processes. They also have apps you can add to your site to give extra features, most of these will cost you extra though. AfterPay is available on Shopify and they also have their own payment gateway which can be used in lieu of Paypal, Stripe or the like. 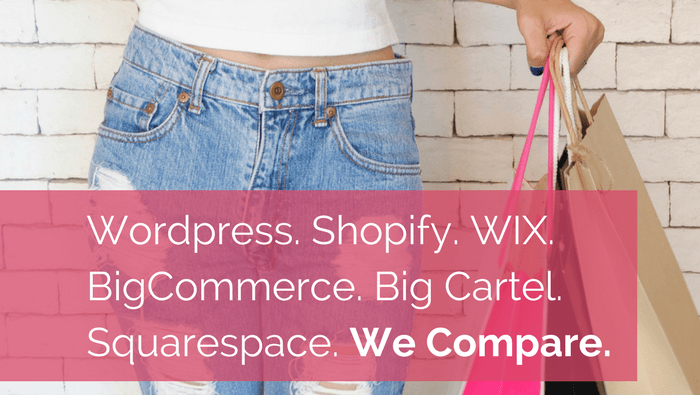 Shopify is slightly easier than WordPress as you avoid some of the technical set up and management worries, however it is not as simple as a Wix site in setup. There are a few steps you need to take and it won’t take you 15 minutes to be up and running. The online support and help guides are accessible at all times to help you through. The blogging side of Shopify is probably its weakest point and WordPress certainly has it covered in that department. SEO is good on Shopify and you shouldn’t have any problems with the search engines reading your pages. It also integrates well with online marketing tools such as AdWords. Note: Like Wix, if you choose the Shopify platform, your content is fairly locked into their portal. Should you wish to change website platforms, you may lose a fair bit of your data in a transfer. This could mean you will most likely be looking at a fresh build. If transferring to WordPress, you will find plugins that transfer files and data in .csv format, but as with anything digital, there is always an element of risk involved. Generally page content, images and blogs will transport over, however product data will not transfer across. An Australian based website platform, BigCommerce is still rather new on the scene opening in 2015. In saying that, it is by no means a baby, priding itself as being one of Australia’s most popular hosting platforms with over 95,000 users. BigCommerce is more of a heavy weight hosted platform that is suited to serious eCommerce businesses that like features and support. It is harder in the learning curve aspect and will take a few hours of learning the platform before you can confidently get your store up and running, but your patience will be rewarded. We’ll get cut straight to the chase and tell you that BigCommerce isn’t as cheap as its competitors, but you will find more features and a more capable platform that will grow with your business. Support is 24/7 and available via phone, email or live chat and with your website managed on their hosted servers, you don’t need to worry about backups, security or technical issues. 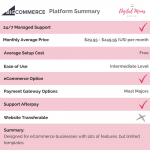 Pricing for BigCommerce starts at $29.95 per month for their base package up to $249.95 per month for the Pro package. Features do increase as the packages increase and users can benefit from must-have marketing tools such as abandoned cart saver and Google reviews as standard in the Plus and Pro packages. Unlike their competitors, BigCommerce pricing structure has a cap on sales, meaning when you reach the sales threshold (i.e. $50,000 on the Standard package) you must go up to the next package. The pay off for this though is no transaction fees, meaning you only pay fees on your chosen payment gateway provider. BigCommerce website packages come jam packed with features from the get-go though, so you can easily start on the Standard package and not feel like you are missing out. Integration through Facebook shop, Google shopping and Ebay is standard as is dedicated SSL which is a must for all online shops. You will also enjoy unlimited file storage and bandwidth which is not considered standard practice. The downside to BigCommerce is probably their lack of template options with only 7 templates available for free. They do have 76 pro/paid templates that you can use and prices for those vary from $145 – $235 as a one off payment. They appear to be of a very high quality and design and all templates are fully responsive for mobile use, however they are a little on the pricey side. This is one area where their competitors like Shopify do have the upper hand. BigCommerce is perfect for any business type from fashion to homewares through to electronics and health stores. Websites on BigCommerce do have a very professional appearance and it would be hard to tell that you built it yourself with little to no website knowledge. 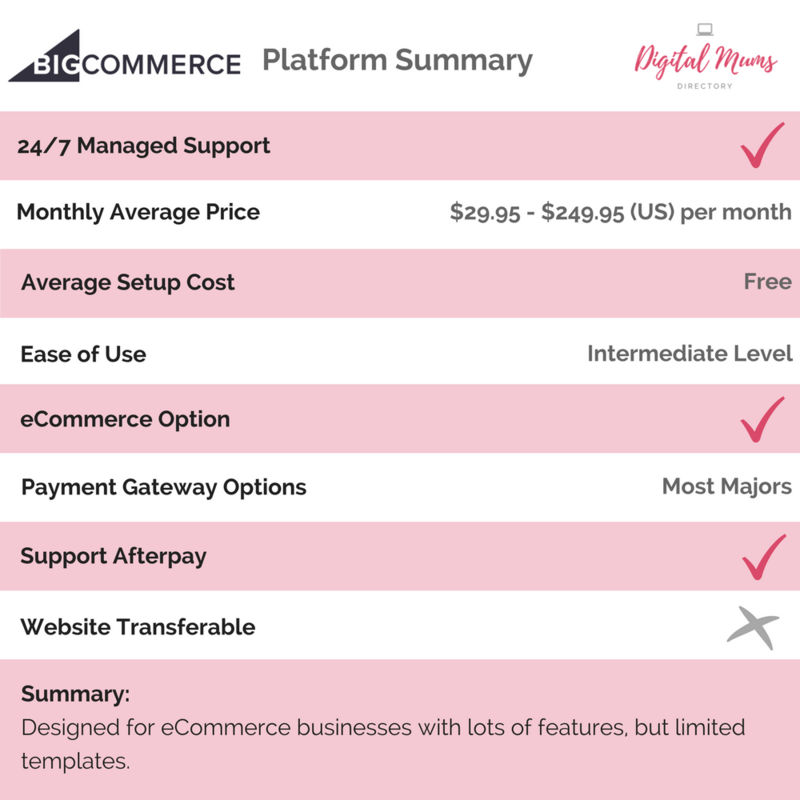 If you are looking to DIY and don’t mind paying a monthly fee for piece of mind and stress free marketing, then BigCommerce is worth a look. Squarespace is another good all rounder that is used by over a million users around the world. It is a fully hosted website platform, so again, there is no need to worry about your host, backups or security updates. Themes come with a page builder for easy site building and customisations, but not as easy to use as the Wix and Weebly drag and drop builders. 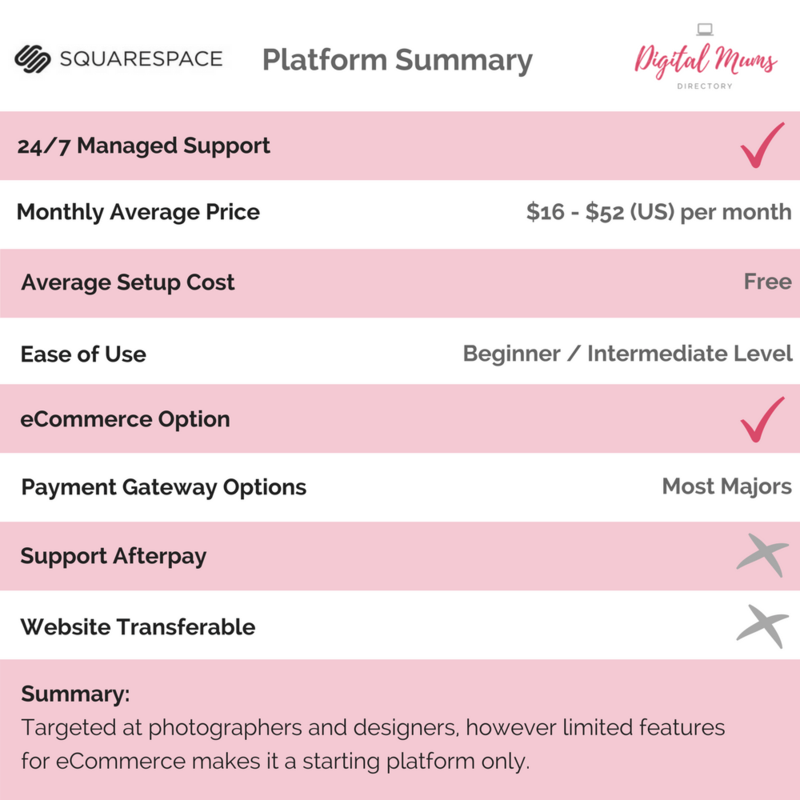 The plus side for Squarespace, however, is the online support and help videos that makes it a lot more appealing to the DIY designer. Squarespace theme templates are very design focussed, opening the door for photographers, designers and image heavy sites to showcase their wares in eye-catching fashion. High res images and a bit of a flare for design will ensure you get the best out of a Squarespace site. They also cater for the eCommerce online store business with an integrated shopping cart and Stripe and Paypal at the ready. There are no transaction fees on their eCommerce plans, however there is a 3% transaction fee on the business plan. Being a hosted platform, there are monthly charges that apply ranging from $16 per month for the Basic package to $61 per month for the Advanced package. All packages come with SSL as standard so you can be assured you are ticking the Google compliancy box straight up. Squarespace also integrates with Xero so accounting is made as easy as possible. Service is 24/7 so you need not worry if you get stuck at 3am the day before launch. Squarespace is a little different in its interface and takes a little bit to get use to. The page builder isn’t as user friendly as its competitors and the learning curve is also a little steeper. Once you get there though, you will end up with a website that will rival any web designers work. If you are looking for a bit of wow factor in your site without the hosting and maintenance hassles, then Squarespace is an option to consider. Popular amongst artists and designers, Bigcartel is a managed ecommerce platform aimed at creatives. Created in 2005 by Matt Wigham, who was looking for a platform to sell his band merchandise, Bigcartel has expanded global with almost a million users. Bigcartel is considered easy to use and is quite simple in its design. It has less features than its competitors which can be a pro and con for the platform. 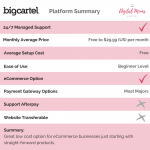 If you are looking for a very simple platform to sell your wares that doesn’t focus too heavily on the technical side of website design, then Bigcartel could be for you. It is designed for the creatively minded market who prefer to focus their time on making their products rather than their website. It makes selling very easy with quick product upload and settings. The downside is there are limited features for taxes, shipping and images – so you are restricted in how you can sell. All packages except the free package allow for five images per product only which can be restrictive depending on the product you are trying to sell. The free package allows for only one image. The pricing structure of Bigcartel is very straightforward and not over priced. You can set up a basic store of up to 25 products for as little as $9.99 per month. If you only have 5 products or less you may get away with the free package, however your features are significantly limited. Their top package allows for up to 300 products and it is $29.99 per month. Ongoing costs are minimal with hosting being taken care of by BigCartel. You can use your own domain name on the paid packages but not the free package. Features include Google Analytics integration, Zapier integration (paid), Facebook store, Mailchimp and Live Chat and integration with four payment gateways being Paypal, Stripe, Square and Apple Pay. Bigcartel do not charge any transaction fees for sales, however the payment processors do. There are thirteen themes to choose from and all are mobile responsive which is very important with the majority of users shopping via their phones and tablets. They are quite simple in their designs and no coding knowledge is necessary, but access to the coding area means you can play with the html and css to boost the designs or redesign completely if you have the knowledge. If you are a small handmaiden, jewellery maker or artist looking for an easy way to build an online presence without the hassle then Bigcartel could be your lifesaver. 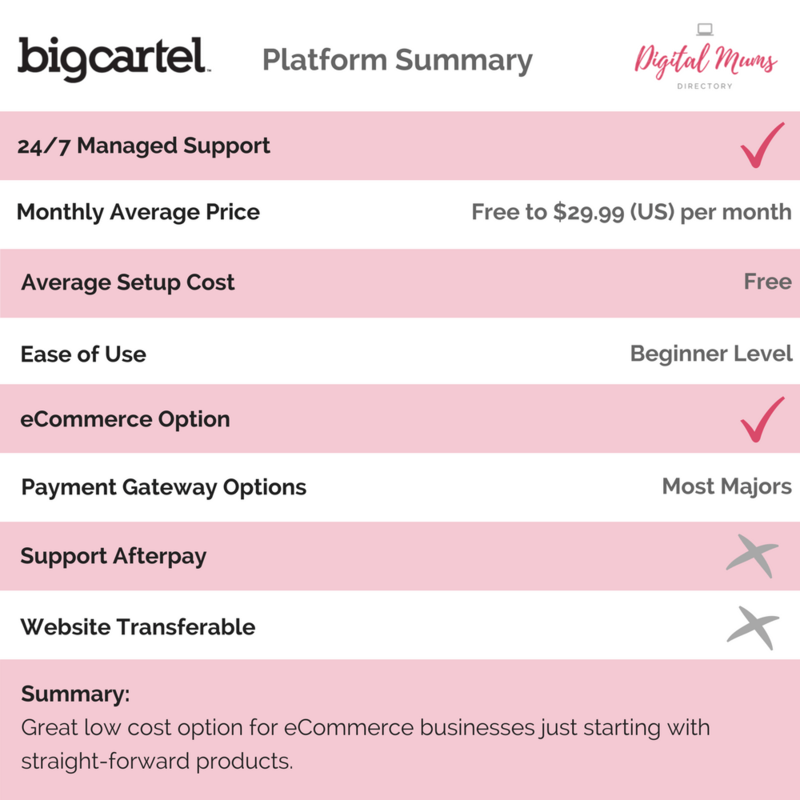 If a lack of features and options frustrates you or your business is growing fast, then Bigcartel may not be big enough or strong enough for what you need. With all that said and done, below is a highlight reel of each platform and what they offer you and your business. Choosing the right platform for you is a personal decision based on your business needs. We do suggest that you look not only at the short term, but also the long term vision for your business. It’s important that the platform you choose can work with you for the long haul. 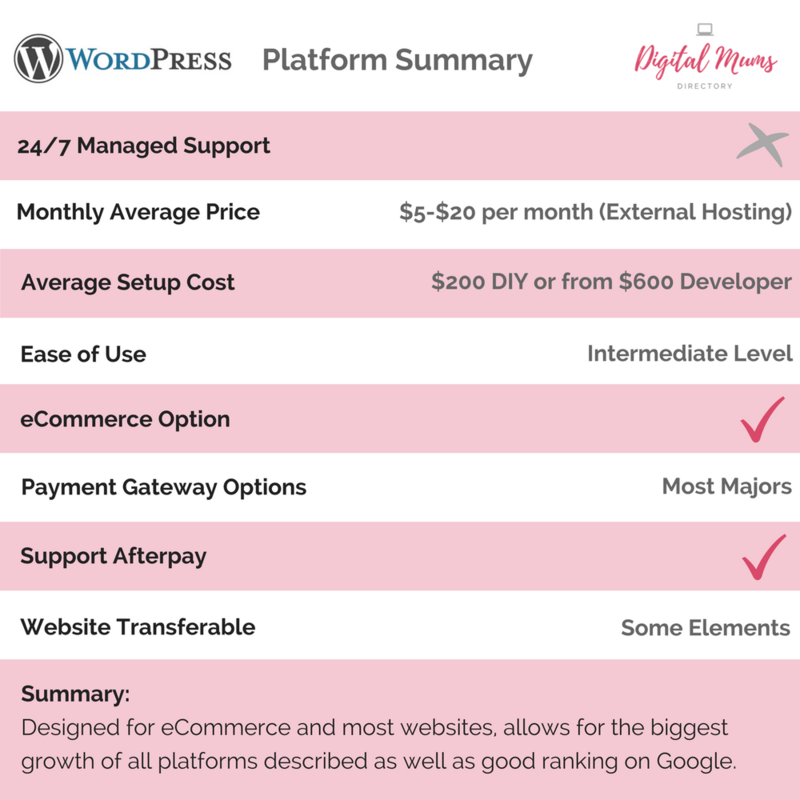 This guide has been developed for Australian Business Mums who are looking to start an online business and want to understand how they can create a Wordpress website with a WooCommerce online sales platform. 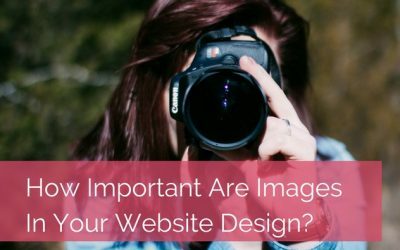 How Important Are Images In Your Website Design? *Spoiler alert* its not to look pretty, great images can help drive more traffic to your website.